Named by Pliny the Elder in 77-79 from the Greek "galene" meaning "lead ore". Often will form triangular pits in poorly polished sections. Neoarchean to Quaternary : 2567 Ma to 0 Ma - based on 26 recorded ages. Cubes, octahedrons, cube-octahedron combinations and rarely dodecahedrons. Argentiferous Galena Silver-bearing galena. Usually, the silver is present as tiny inclusions of various silver sulphosalts. Auriferous Galena A gold-bearing variety of galena. 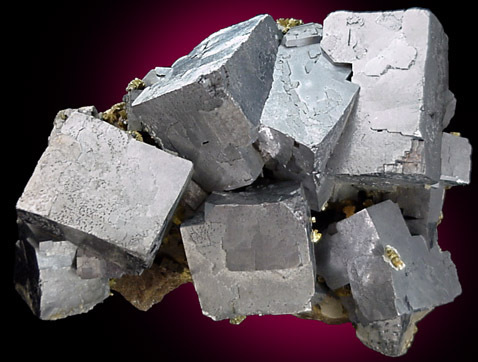 Bismuthiferous Galena A variety of galena containing up to 16 weight percent of bismuth. Blaubleierz Galena pseudomorph after pyromorphite (see also plumbeine). Also used for coatings of epitaxial, oriented films of galena on pyromorphite. Galène tricotée Literally means "knitted galena". The German name is Strickblende when it occurs with colloform sphalerite or Gestrickter Bleiglanz when no colloform sphalerite is present. Gestrickter Bleiglanz Acicular Galena. Literally means "knitted galena"; a similar designation is Strickblende but that name only can be used when colloform sphalerite is present as well. The French name is "Galène tricotée". 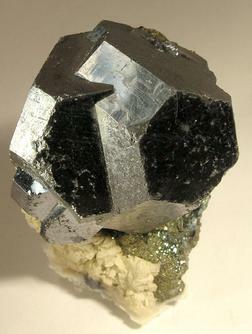 Johnstonite (of Haidinger) Possibly galena with a supposed excess of S. Mat be a mixture of Galena, Anglesite and/or Sulphur. 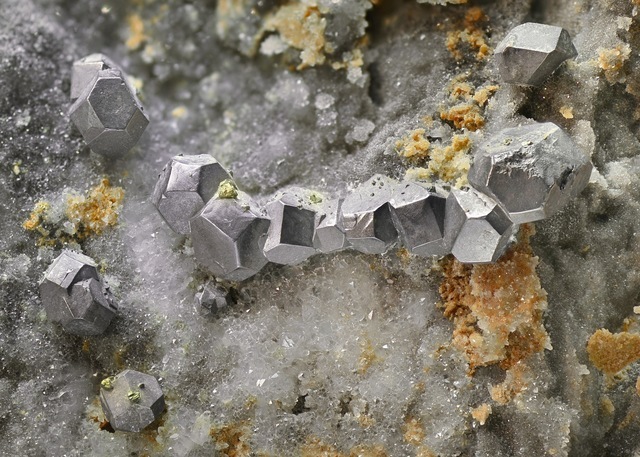 Plumbeine Galena pseudomorphs after pyromorphite (identical to Blaubleierz) - originally thought to be a hexagonal polymorph of galena (A. Breithaupt, 1863: Berg. Hütt. Zeit. 22, 36). Selenian Galena A selenium-bearing variety of galena. U-Galena A variety of Galena containing uranium-derived lead of isotope Pb-206. Sphalerite 2,782 photos of Galena associated with Sphalerite on mindat.org. Quartz 2,635 photos of Galena associated with Quartz on mindat.org. Calcite 1,537 photos of Galena associated with Calcite on mindat.org. Chalcopyrite 1,402 photos of Galena associated with Chalcopyrite on mindat.org. Pyrite 1,345 photos of Galena associated with Pyrite on mindat.org. Fluorite 1,287 photos of Galena associated with Fluorite on mindat.org. Siderite 832 photos of Galena associated with Siderite on mindat.org. Dolomite 621 photos of Galena associated with Dolomite on mindat.org. Baryte 567 photos of Galena associated with Baryte on mindat.org. Cerussite 475 photos of Galena associated with Cerussite on mindat.org. Semiconductor - used as a point contact diode in early radio wireless sets. Contains lead - always wash hands after handling. Avoid inhaling dust when breaking. Do not lick or ingest. 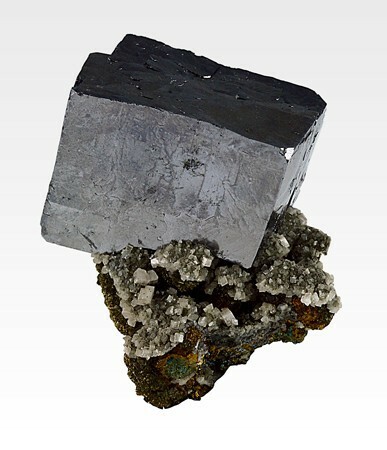 Principal ore of lead. Often contains silver and is a frequent ore of that metal as well. Brown, J.S. (1936) Supergene sphalerite, galena, and willemite at Balmat, NY. Economic Geology: 31: 331-354. Palache, C., Berman, H., and Frondel, C. (1944) The System of Mineralogy of James Dwight Dana and Edward Salisbury Dana Yale University 1837-1892, Volume I: Elements, Sulfides, Sulfosalts, Oxides. John Wiley and Sons, Inc., New York. 7th edition, revised and enlarged, 834pp. : 200-204. Bedarida F. (1965) Osservazioni su fenomeni di sfaldatura in cristalli di galena. Periodico di Mineralogia: 337-354. Blackburn, W.H. and Schwendeman, J.F. (1977) Trace-element substitution in galena. The Canadian Mineralogist: 15: 365-373. Steger, H.F. and Desjardins, L.E. (1980) Oxidation of sulfide minerals; V, Galena, sphalerite and chalcocite. The Canadian Mineralogist: 18: 365-372. Augustithis, S.S. and Vgenopoulos, A. (1982) On the hawleyite-sphalerite-wurtzite-galena paragenesis from Ragada, Komotini, (Rhodope) North Greece. Special Publication of the Society for Geology Applied to Mineral Deposits: 2: 413-417. Franzini M., Troysi M., and Cecchini A. (1984) La microdurezza della galena e le sue variazioni in funzione della temperatura. Rend. Soc. It. Min. Petr. : 39: 717-723. Tossel, J.A. and Vaughan, D.J. (1987) Electronic structure and the chemical reactivity of the surface of galena. The Canadian Mineralogist: 25: 381-392. Foord, E.E. & Shawe, D.R. (1989): The Pb-Bi-Ag-Cu-(Hg) chemistry of galena and some associated sulfosalts: A review and some new data from Colorado, California, and Pennsylvania. Canadian Mineralogist 27, 363-382. Deore, S. and Navrotsky, A. (2006) Oxide melt solution calorimetry of sulfides: Enthalpy of formation of sphalerite, galena, greenockite, and hawleyite. American Mineralogist: 91: 400-403. George, L., Cook, N.J., Ciobanu, C.L., Wade, B.P. (2015): Trace and minor elements in galena: A reconnaissance LA-ICP-MS study. American Mineralogist, 100, 548-569. The following Galena specimens are currently listed for sale on minfind.com. Showing 28 significant localities out of 25,971 recorded on mindat.org. CATHRO, R.. Great Mining Camps of Canada 1. The History and Geology of the Keno Hill Silver Camp, Yukon Territory. Geoscience Canada, North America, 33, sep. 2006.; Oscar Jose Tessari (1979) Model Ages and Applied Whole Rock Geochemistry of Ag-Pb-Zn veins, Keno Hill - Galena Hill Mining Camp, Yukon Territory. MSc Thesis, University of British Columbia. Schachner, D. (1961) Die Blei-Zink-Lagerstätten in der Triasmulde Maubach-Mechernich-Kall. Der Aufschluss, 10. Sonderheft. ; Meyer, W. (1983) Geologischer Wanderführer: Eifel. Franckh'sche Verlangshandlung W. Keller & Co., Stuttgart. Henwood, W.J. (1871) Transactions of the Royal Geological Society of Cornwall 8(1), 105.; Gasparrini, C. (1978) Unpubl. report, Minmet Scientific, Toronto, Canada; Taylor, S. and Andrew, C.J. (1979) Trans. Inst. Mining Metall., sect. B, 88, 125; Economic Geology (1984) 79, pp. 529-548.; Andrew, C.J. (1987) pers. comm. ; Ryback, G. Nawaz, R. and Farley, E. (1988) Seventh Supplementary List of British Isles Minerals (Irish). Mineralogical Magazine, vol. 52, n° 365, pp. 267-274.; Moreton, S. (1999) Mineralogical Record, 30, 99-106. No reference listed; Coppola, V., Boni, M., Gilg, A., and Strzelska-Smakowska, B. (2009): Mineralium Deposita 44, 559-580. Zsivny, V. and Naray-Szabo, I.V. (1947) Parajamesonit, ein neues Mineral von Kisbanya. Schweizerische mineralogische und petrographische Mitteilungen: 27: 183-189.; Fleischer, M. (1949) New mineral names. American Mineralogist: 34: 133.; Cook N.J. and Damian, G. (1997) New data on "Plumosite" and Other Sulfosalt Minerals from the Herja Vein Deposit, Baia Mare District, Rumania. Geologica Carphathica: 48: 387-399. Fluorite: The Collector's Choice. Extra Lapis English No. 9; Rocks & Minerals (1995) 70:396-409; Segeler, Curt and Molon, Joseph. (1985), The Thomaston Dam Site, Thomaston, Connecticut; Rocks & Minerals: 60(3): 119-124.; Vogt, Wolfgang. (1991), Rediscovering Thomaston Dam. Lapidary Journal: April. ; Zodac, Peter. (1959), Minerals at Thomaston Dam, Connecticut; Rocks & Minerals: 34: 3.